According the US Department of Labor slips, trips and falls account for the majority of accidents that occur within general industry. Typically these types of accidents occur due to a loss of traction between ones shoe and the walking surface or when inadvertent contact with a fixed movable object occurs which may lead to a fall. 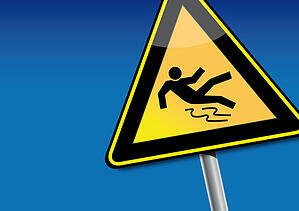 Most slip, trip and fall incidents are preventable with general precautions and safety measures. Create Good Housekeeping Practices—Plan ahead and know what needs to be done and who is going to be doing what in particular work areas, assign responsibilities, and implement a program that establishes good housekeeping procedures as part of daily routines. Reduce Wet or Slippery Surfaces--Traction on outdoor surfaces can change considerably when weather conditions change. Such conditions can then affect indoor surfaces as moisture is tracked in by pedestrian traffic. Traction control procedures should be constantly monitored for their effectiveness. Create and Maintain Proper Lighting—Poor lighting in work areas is associated with an in increase in incidents so always use proper illumination in walkways, stairways, ramps, hallways, basements, construction areas and dock areas and always keep areas around light switches clear and accessible. Repair fixtures, switches, and cords immediately if they malfunction. Wear Proper Shoes—The shoes employees wear can play a big part in preventing falls. Employees should be expected to wear footwear that is appropriate for the duties they perform. Control Individual Behavior—Employees should make all efforts to stay alert and pay attention to their actions and their surroundings. Taking shortcuts, not watching where one is going, using a cell phone, carrying materials which obstructs the vision, wearing sunglasses in low-light areas, not using designated walkways and speed are common elements in many on-the-job injuries.